Boston Red Sox pitcher Steven Wright has been suspended 80 games after testing positive for a performance-enhancing drug. Boston Red Sox pitcher Steven Wright has been suspended for 80 games following a positive test for Human Growth Hormone. 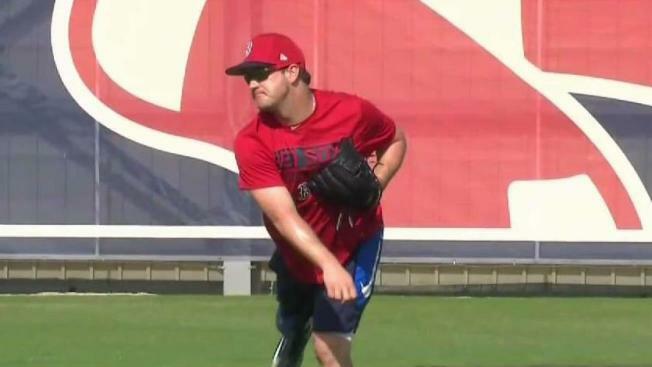 Major League Baseball made the announcement Wednesday, the latest in a series of setbacks for the 34-year-old knuckleball pitcher. The commissioner's office says he tested positive for Growth Hormone Releasing Peptide 2 (GHRP-2). The only other player to test positive for growth hormone under the big league program was Los Angeles Dodgers pitcher Josh Ravin in 2016. MLB and the players' association agreed to blood testing for HGH before the 2013 season. "The Boston Red Sox fully support Major League Baseball's Joint Drug Prevention and Treatment Program and its efforts to eliminate performance-enhancing substances from the game," the team said in a statement. "While we are disappointed by the news of this violation, we will look to provide the appropriate support to Steven at this time." The Red Sox said they would not comment further.